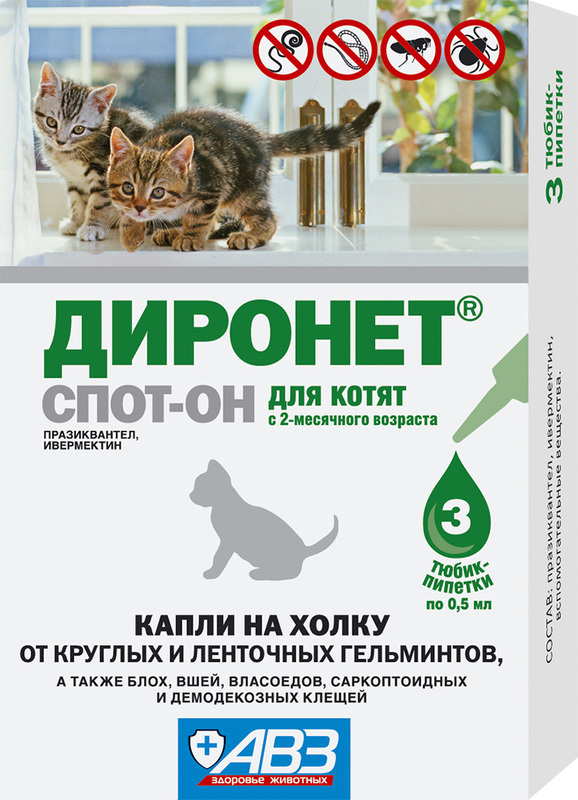 Dironet spot-on for dogs, cats, puppies and kittens is dispensed in 0.5 ml and 1 ml polymeric droppers packed in cartons (3-4 pieces). Drops on the withers against worms. Fast and effective disposal from all types of worms and ectoparasites. Perfect for perverse pets that reject tablets and suspensions. Ultimate medicinal effect without animal stress. Depending on modification, 1 ml of the drug contains as active ingredients, respectively: Dironet spot-on for dogs - 85 mg of praziquantel and 20 mg of ivermectin, Dironet spot-on for cats - 85 mg of praziquantel and 5 mg of ivermectin, as well as excipients. The mechanism of Dironet spot-on action includes broad-spectrum antiparasitic effect and activity related to larval and mature development phases of intestinal roundworms (including Toxocara canis, Toxocara cati, Toxascaris leonina, Ancylostoma spp., Uncinaria stenocephala, Trichuris vulpis), cestodes (including Echinococcus granulosus, Echinococcus multilocularis, Diphyllobothrium latum, Dipylidium caninum, Multiceps multiceps, Taenia spp., Mesocestoides lineatus), fleas (Ctenocephalides spp. ), sucking lice (Linognatus setotus), lice (Trichodectes canis), sarcoptic (Sarcoptes canis, Otodectes cynotis, Notoedres cati) and demodectic (Demodex canis) ticks parasitizing dogs and cats. After dermal application drug absorbs in site of application, passes into systemic blood, organs and tissues providing active antiparasitic effect. It has insecticidal acaricidal effect on fleas, sucking lice, lice, sarcoptic and demodectic ticks that are on animals during processing. Mechanism of ivermectin action (a component of the drug) involves influence on chloride ions current level through membranes of nervous and muscle cells of a parasite. The primary targets are glutamate-gated chloride channels and GABA receptors. Change in chloride ions current level damages impulse conduction resulting in paralysis and death of ectoparasites and roundworms. Mechanism of praziquantel action (a component of the drug) is based on neuromuscular ganglionic blocker depolarization, damage of glucose transport and microtubule function of all development phases of cestode resulting in muscular innervation disorder, paralysis and death of parasites. Use Dironet spot-on for adult dogs and cats, puppies and kittens above 2 months old to treat and prevent intestinal nematodosis, cestodiasis, entomosis, otoacariasis, sarcoptic mange, notoedrosis and demodicosis. Do not use Dironet spot-on in puppies and kittens under 2 months old, pregnant, lactating, contagious and recovering animals. Due to increased sensitivity of Collie, Bobtail and Shetland sheepdog to ivermectin, process these puppies under attending veterinarian's control. Spot-on application on dry intact skin. Before administration chip off dropper's closure, spread animal's hair and apply the drug on the skin along the spinal column out of the reach of licking (in the region of neck near skull base or between scapulae). Large animals: apply dropper content in 3-4 points on skin. Minimal therapeutic dose for adult animals: 0.2 ml/kg of body weight. Minimal therapeutic dose for puppies and kittens: 0.1 ml/kg of body weight. Select appropriate volume of dropper or its combination and administer the drug in listed doses in the light of type, age and body weight of animal. Treat an animal with a single dose to kill fleas, sucking lice and lice. Treat monthly (within all season of insect activity) to prevent reinvasion. Apply single dose on skin to treat otoacariasis (ear mange). If applicable, repeat treatment course in a month. It is recommended to clean acoustic meatus from exudate and sloughs during treatment. In case of complication by otitis, administer antimicrobial and anti-inflammatory drugs. Treatment of canine sarcoptic mange and demodicosis and feline notoedrosis: 2-4 times, 10-14 days apart until double negative result of acarological testings. Prevention: monthly administration. Combination treatment with etiotropic, pathogenetic and symptomatic medications is recommended according to package inserts. Administer the drug in a single dose (for treatment) or quarterly (for prevention) to deworm animals with nematodosis and cestodiasis of gastrointestinal tract. Do not apply on wet (damaged) skin or wash an animal within 4 days after processing with the drug. Do not use simultaneously with other antiparasitic drugs. Adverse events and complications are not observed in case of administration as per package insert. Due to increased individual sensitivity, lacrimation, excess salivation, muscular shivering, vomiting or signs of skin irritation in application site are rarely possible. In these cases stop drug administration and wash it away with water and soap or shampoo. Store in original package. Protect from light and moisture. Keep out of the reach of children and animals. Store separately from food and animal feeding at 0-30°С.